Usually when I write about Angies List it’s to talk about the latest home project we’ve used the service to find contractors for but there’s another benefit of Angies List that doesn’t come up that often. I touched on it before when I wrote about the discount movie tickets we found on Angies List, it’s what they call their “Member Benefits”. Basically the service has enough members that they’re able to offer special group discounts for a variety of travel, shopping, dining, and entertainment merchants. This is different than their Big Deal service (which is basically weekly deals on local contractor services), the Member Benefits are standing discounts for signing up for or using one of the merchants in the program. So far the only discount we’ve actually taken advantage of are the movie tickets but yesterday I got an email that caught my attention about deals for 2 other services that we already use – Costco and ScoreBig. 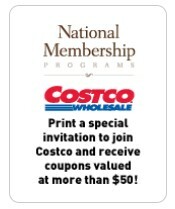 We’ve belonged to Costco for several years now and I’ve written about a variety of Costco membership discounts you can use so I had to investigate when I saw Angies List members could get $50 worth of Costco coupons. Unfortunately I don’t qualify because it’s for new Costco members only, which is too bad because we would definitely take advantage of it. The way it works is you get a special link to Costo once you’re logged into the Angies List website. You’re taken to a page where you fill out your new member application online. When you go into the store and become a member you’re given Costco coupons for $50 worth of free merchandise – right now the offer includes free coffee, bottled water, and rotisserie chicken. Obviously it would be better if you got free Costo membership or even a discounted rate but the coupons are still a good deal. We already buy all three of those things from Costco (a lot more coffee recently now that we have a newborn) so it would definitely save us money. On a side note, I did find a promotion for existing Costo customers while poking around that’s not related to Angies List. If you’re a Costo member and you open a True Earnings card or auto charge your membership to any AmEx card you get two months of membership for free. 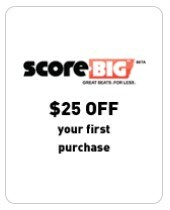 The second promotion that caught my eye was for a service called ScoreBig, where you can find good deals on tickets for performances or sporting events. Unfortunately I’m also ineligible for this promotion since it’s only for new members and I signed up for ScoreBig last summer through a Klout promotion. ScoreBig is basically like Priceline for event tickets, like concerts and sporting events. It’s actually a great service for two reasons. The first cool thing is that you can buy tickets for less than face value. For example, last summer we went to a Major League Baseball game and I offered 50% of the face value for decent seats through ScoreBig and got them at that price. The second thing that made me smile was that you don’t have to use Ticketmaster to buy your tickets. We all know how many fees that Ticketmaster piles on when you buy through them, ScoreBig doesn’t charge any of those fees. The way the ScoreBig promotion works for Angies List members is that you get a special link to the ScoreBig site from the “Member Benefits” section of the Angies List site. You’re also given an Angies List only promo code that you enter when signing up for ScoreBig, that gives you $25 towards your first purchase of tickets. Like I said, I had a similar promotion through Klout last summer, the combination of discounted tickets and the $25 credit meant I got my tickets almost free! The main reason we use Angies List is to help us find quality contractors for house projects so these “Member Benefits” are just an added bonus. It seems like they’re adding more of these discounts, which is cool, gives us more value for our money. If you’d like to try it out but aren’t sure, you can always check out the latest Angies List promotions to get a discount on membership. My only complaint with Costco is that I can never get out of the store without spending more than $100. As such… I try to limit my shopping trips to once every couple of months. We always get the same items when we go so our bill is usually about the same. We’ve figured out the things we buy with the biggest savings and we usually just buy those. We did get some good deals on toys last Christmas.